Scooper - Technology News: Your genes account for 30-50% of your personality. What makes up the rest? Your genes account for 30-50% of your personality. What makes up the rest? The brain is key to our existence, but there’s a long way to go before neuroscience can truly capture its staggering capacity. For now though, our Brain Control series explores what we do know about the brain’s command of six central functions: language , mood , memory , vision , motor skills and personality – and what happens when things go wrong. Personality is a broad term describing how people habitually relate to the world and their inner self. After the developmental period through childhood and adolescence, these patterns of relating remain reasonably stable through life. They are then referred to as traits and influence behaviour, thinking, motivation and emotion. Since everyone is different in their own way, psychologists have debated how to characterise personality. The most popular approach has so far been to use five dimensions : openness to experience (curious or cautious), conscientiousness (organised or careless), extraversion (outgoing or solitary), agreeableness (friendly or detached) and neuroticism (nervous or secure). Understanding the neurological physiology of personality is sometimes seen as the holy grail of psychology, and was the topic of Sigmund Freud’s first paper , Project for a Scientific Psychology, in 1895. Temperament is understood as the way the body produces behaviour. It refers to certain biases an individual has when responding to external stimuli. A well-established model proposes that whereas personality traits are based on habitual behaviour, temperamental traits are someone’s predispositions when it comes to four areas: harm avoidance, novelty seeking, reward dependence, and persistence. These are closely related to basic emotions such as fear, anger, attachment and ambition. 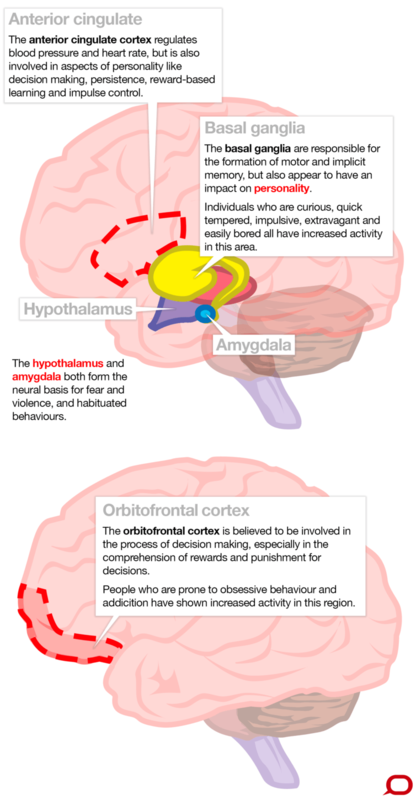 Individuals with such traits have increased activity in the fear circuit of the brain , involving the amygdala and other structures of the limbic lobe. This activity has been linked to abnormalities in two neurotransmitters: serotonin and γ-amino butyric acid (GABA). Modulating these with drugs – such as selective serotonin reuptake inhibitors (SSRIs that include Prozac) and benzodiazepines, including Valium – can help people with depressive, anxious and obsessive thoughts. Novelty seeking leads to exploration and individuals high on this trait are curious, quick-tempered, impulsive and easily bored. They have increased activity in the basal ganglia , which are clumps of neurons sitting in the middle of the brain. This trait has also been linked to the so-called pleasure molecule dopamine, which acts on the basal ganglia, and changes in this pathway are associated with seeking novelty in different ways . Persistence leads to the maintenance of a behaviour despite fatigue, repetitiveness and frustration, and often results in such qualities as industriousness and determination. The regions of the brain particularly important for this include the inner and lower parts of the frontal lobes, especially those called the anterior cingulate and the orbitofrontal cortex , and their networks that involve the basal ganglia. Persistence is loosely related to motivation. Emotion plays a major role in maintaining this drive , as basic emotions, such as happiness, tend to energise behaviour and lack of emotion has the opposite effect. There is, however, considerable evidence that people with higher intelligence, as measured on psychometric tests, have larger brains on the average . Geniuses whose brains have been studied and found to be large include Carl Gauss (mathematician), Rudolf Wagner (composer) and Vladimir Lenin (political leader), although there are also many exceptions to this rule. A network involving the frontal, temporal and parietal lobes is important for these functions , with reasoning and abstraction being largely frontal lobe functions, symbolic representation served by the temporal and parietal lobes and formation of new memories facilitated by the hippocampus and the memory network. There is also considerable redundancy in these networks, as they have an innate ability to compensate, sometimes referred to as neuroplasticity . An excellent example of neuroplasticity was demonstrated in London taxi drivers who were shown to have increased grey matter in the back part of their hippocampi – related to spatial representation of the environment - when compared to those who weren’t professional drivers. Neuroplasticity is instrumental in recovery from brain injury , such as after a stroke, when other parts of the brain take over some of the functions of injured regions. Researchers have begun to look at the neurological biology of various personality disorders. One subject of interest has been multiple personality disorder, now referred to as dissociative identity disorder. People suffering from this have been reported to have reduced volumes of the hippocampus and amygdala and reduced activity of the orbitofrontal cortex . These have been linked to childhood trauma which results in abnormal regulation of emotion.